Most people who meet me say I have an “old soul.” I like that. I’ve always had a love of all things history: antiques, vintage clothing, old cars, and older people (do you hear me Sir Sean Connery?). So when I heard a few years back that Dogfish Head Brewery brewed a beer based on the oldest beer recipe known to man I began a quest to find and drink this beer. About 10 years ago Dr. Patrick McGovern, biomolecular archeologist at the University of Pennsylvania Museum of Archaeology and Anthropology, took his study of ancient fermented beverages to a little town in the Henan Province of China called Jiahu. While studying a 9,000 year old Neolithic burial site he discovered some pottery jars that once contained a fermented beverage consisting of rice, honey and fruit. He contacted his friends and Dogfish Head and that’s when the magic happened. Dogfish Head, never being one to turn down a chance to brew history, took the ancient recipe and created something truly special: Chateau Jiahu (jee-ah-who). In keeping with the ingredients of the original recipe Dogfish Head used brown rice syrup, orange blossom honey, Muscat grape, barley malt and hawthorn berry. Sake yeast is added to the wort and then left to ferment for about a month. The result? 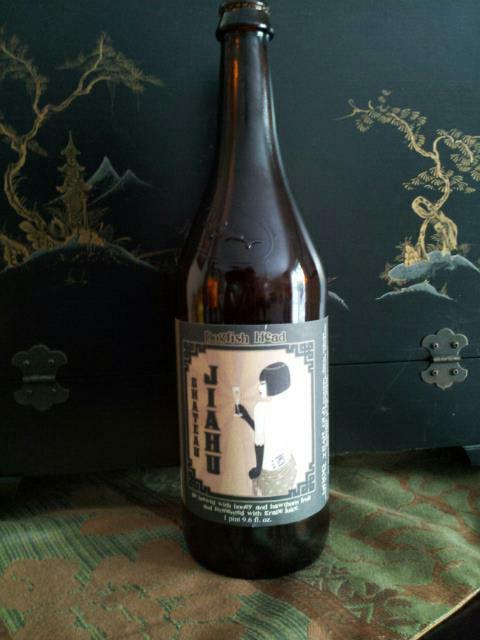 A very elegant beer worthy of an emperor. While pouring into the glass the body is reminiscent of honey mead: thick and syrupy. The aroma is definitely heavy with honey. To be honest, I was little worried that this beer would be too thick and too sugary to enjoy. I have to say after my first sip I was pleasantly surprised. This full-bodied beauty is definitely a sipper, but a very nice one. Honey is the dominant flavor with fresh grape notes and a resin and clove finish. After a few sips I had to remind myself I was not drinking wine. As I sipped away at this ghost of millennium past, my old soul was wondering if our ancestors enjoyed this beverage as much as I was. Maybe I’m a reincarnation of one of the lucky folks who got to partake in the drinking of this pretty beer. Or maybe, the 10% ABV was getting to me. Chateau Jiahu is only available for a limited time so be sure to go onto Dogfish Head’s website and use their “fish finder” to locate a bottle near you!